To join NHAS click here. To request a skywatch, or send a general question, please use the information request form. To contact a specific member of the NHAS staff, please use the email links below. Larry has been an NHAS member since 1994. He first fell in love with astronomy at 7 years old, when he received a 2" reflecting telescope (that’s right a Newtonian telescope not a refractor) and a family friend showed him Jupiter and Saturn. He enjoys helping out at Sky Watches and talking about astronomy with the public. He owns an 18" Obsession, an old classic C8, a 110mm refactor, and a Coronado Hα solar scope. He enjoys deep sky observing hunting down faint objects. He is also a former president of the Vermont Astronomical Society. 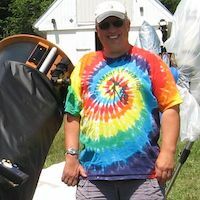 Tom has been an NHAS member since 2006 and has been involved in a wide range of club committees and activities from the Education Outreach Committee and Library Telescope Program to public observing, sidewalk astronomy and coordinating major-event participation like Market Square Day and First Night in Portsmouth, N.H. As co-founder of the New England Fall Astronomy Festival he continues to wear many hats including sponsorship solicitation, coordinating guest speakers, and event promotion. Early in his membership, Tom also secured a $5,000 grant for NHAS from the New Hampshire Charitable Foundation that made it possible for the club to purchase the new laptops, video projectors and screens used in public outreach presentations. When not involved in NHAS activities, he manages parking operations for the City of Portsmouth and serves as one of only three NASA Solar Systems Ambassadors in the state. One of the astronomy equipment addicted, he has way too much astronomy 'stuff' to list in this limited space. 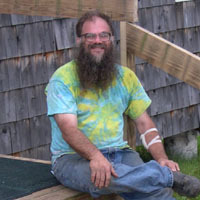 Paul has been an NHAS member since 2004. An avid amateur astronomer as a teenager, he actively resumed the hobby in 2003. 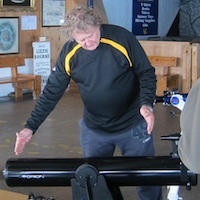 His main astronomical interests are public observing, deep-sky objects, and carbon stars. 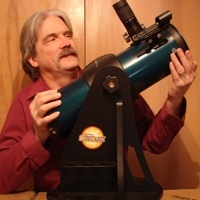 Paul's current telescopes are a 14" TScope reflector, 85mm TeleVue refractor, and a Coronado PST H-alpha scope. When not observing, Paul is a software engineer with Intel Corporation. Pete has been a NHAS member since 2011. 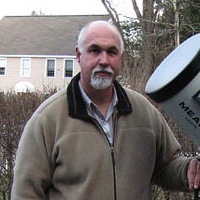 A latecomer to astronomy, he went to the New England Fall Astronomy Festival at UNH and it convinced him to buy an Orion XT8i Dobsonian reflector and join up with NHAS. Pete enjoys visual observing and attending an occasional skywatch. He became interested in the Library Telescope Program. in March of 2012 when attending a "Mod Party" where NHAS members modify the Orion Starblast scopes to LTP standards. When not scouring the skies for nebulae and galaxies, he enjoys scuba diving, hiking, camping and listening to the blues. * Upon graduating from 9th grade, the librarian gave him that book to keep as he was the only person in three years to have checked it out regularly. Steve has been an active NHAS member since 2011. His serious astronomy education began as an undergraduate lecturer at the Museum of Science's Charles Hayden Planetarium. 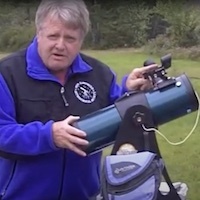 After teaching Observational Astronomy at Northeastern University for three quarters, he moved to New Hampshire and taught Earth Science in Merrimack for thirty-seven years, retiring in 2011. Steve's favorite NHAS activity is Public Observing. 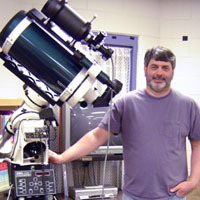 He is active in the Educational Outreach Committee and the Library Telescope Program. He currently observes with an Orion XT10i and an Orion XX14g. 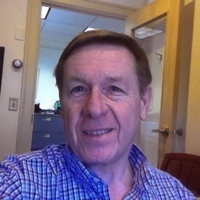 Joel is a founding member of NHAS, telescope maker, former president (three times), former board member, former secretary, hybrid car nut, machinist, trumpeter, space and classical music lover, and Yogi. Herb has been a member of NHAS for fifteen years, ten of which he has spent imaging the night sky with various telescopes and cameras. One of his pet projects is imaging Saturn through one complete orbit of the Sun. He hopes to complete this project sometime in 2033. 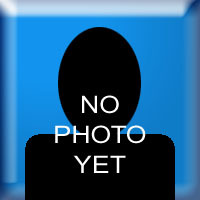 When he's not doing visual observing or Astrophotography, Herb works as a Property Manager on Newbury Street in Boston. Scott has been a member of NHAS since 2008 and the EOC co-chair since 2012. He has been an amateur astronomer since receiving his first telescope on his 11th birthday. 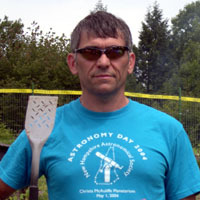 Scott enjoys studying the historical aspects of astronomy, and he has a goal of building his own observatory one day. Scott's day job is working in the IT Department for the United States Bankruptcy Court. Gardner has been an NHAS member since 2003 and Public Observing Co-Chair beginning in 2010. He has also served two terms as club president and has served on the NHAS Board of Directors. 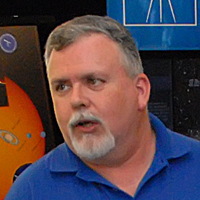 He is active with the Educational Outreach Committee and the Public Observing program and received the NHAS Public Observing Recognition Award for 2003. When not involved with NHAS activities and astrophotography pursuits he is a Camera Service Technician with Axsys Technologies/General Dynamics Advanced Information Systems in Nashua, NH. Matt has been an NHAS member since 2004 and served two terms as club president. He is a software, systems, and cloud engineer by trade, holds an Astrophysics degree, and is the former Chief Technology Officer at the SLOOH online observatory. 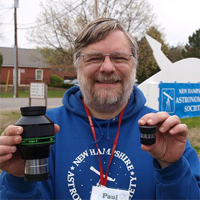 When the New Hampshire weather permits, he images the skies with a Vixen VC200L Cassegrain and William Optics 80mm APO refractor, both on an AstroPhysics 900GTO mount.